Please read the following descriptions of possible tours and then proceed to our survey to rank the six options from 1 (most likely to sign up) to 6 (least likely to sign up). You can also call 258-0252 instead of participating in the online survey. Spend two incredible nights experiencing the culture of Dublin, Ireland’s rollicking capital city. Come to know a few of the locals as you stay in a country farmhouse B&B. Embark on a scenic cruise up the River Lee from Cobh to Cork. Travel the spectacular Ring of Kerry, one of the world’s great coastal roads. Prepare for a true Scandinavian adventure. Visit 3 countries; Sweden, Norway and Denmark. Set out on a Norwegian fjord cruise aboard your Royal Caribbean cruise ship that includes the majestic Geirangerfjord, a UNESCO World Heritage site. Savor Swedish Cuisine at Fem Sma Hus, a charming evening dining in cellars furnished like a private castle. Stroll the streets of ancient Bergen, a town once built entirely from wood. Venture off your ship to explore the quaint Flam, nestled at the end of Aurlandsfjord and Alesund, a living example of a Viking era fishing village famous for fresh seafood. Enjoy free time in Bergen, Flam, Geiranger, Alesund, Stockholm and Copenhagen; and aboard your luxury cruise ship. Explore the stunning history of the 17th century warship Vasa at the Vasa Ship Museum. Explore the grounds and gardens at Tivoli, Copenhagen’s world famous park before joining your fellow travelers for a farewell dinner. Stroll the ancient streets of charming Bergen while soaking up the glacial scenery which surrounds the town. Bryggen, Bergen’s old Hanseatic wharf, is a UNESCO World Heritage site. Savor Swedish cuisine at the 17th century Fem Sma Hus. Sheer cliffs and magnificent waterfalls greet you while visiting Geraingerfjord. Explore the sights and sounds of Tivoli Gardens**, a favorite relaxing spot for local Danes. Enjoy a 7-night cruise of the Norwegian fjords. Walk the lanes of Alesund, a fishing village dating back to the Viking times. Explore the quaint village of Flam, nestled at the entrance to the stunning Aurlandsfjord. See Portugal as few have. From the rhythms of Fado to the realm of the Knights Templar, explore this Iberian gem. Travel to the Portuguese Riviera. Stay in a series of pousadas – elegant, unique, historic hotels. Visit 10 UNESCO World Heritage sites, including the Tower of Belem. Call upon Porto, birthplace of Prince Henry the Navigator. Investigate the Royal Palace Ducal and the National Museum of Coaches. Follow the contours of the Douro River and savor local wines from the world’s oldest wine making region. Linger in Cascais on the Portuguese Riviera. Watch the secrets of Portuguese cuisine come to life during an interactive cooking class. Raise a glass of the nation’s renowned Port and toast a land with a fascinating past and modern charm. Enjoy 10 nights of accommodations in Portugal’s famous pousadas (historic lodgings). Spend three nights on the "Portuguese Riviera” with deluxe accommodations in a 15th century fortress. Learn the history of the Knights Templar when you visit the Convent of the Order of Christ. In a historic setting, discover the secrets of Portuguese cuisine during a cooking class complete with wine pairings. Enjoy 4 wine cellar visits with tastings including Muscatel, Port, sparkling Raposeira and Alentejo wines. Visit the famous Baroque Mateus Palace and gardens for a glimpse into the aristocratic lifestyle. Wine is served with every included dinner. Whisper Headsets are included each day for your convenience. This Danube River Cruise Tour follows in the footsteps of the Habsburgs, showcasing the historic European river port cities of the former Austro-Hungarian Empire—among central Europe’s most riveting locales. We have added an extra night aboard our award-winning ships in Budapest, allowing for more time to discover this grand capital. We've also modified our itinerary to allow for more scenic daytime cruising along the Danube. Plus, we've enhanced our included city tours of Vienna and Prague, giving you extra time to experience Prague at your leisure. Among this trip's other unique included features are a tour of Austria’s renowned Melk Abbey, charming Durnstein, dramatic Bratislava, Slovakia—a destination often missed by American travelers—and a tour of historic Salzburg, Austria, the birthplace of Mozart and the setting for the timeless film The Sound of Music. 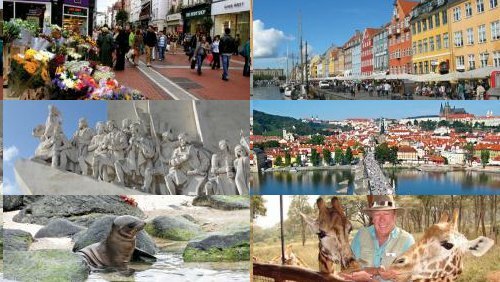 Round out your Central European River Cruise with our exclusive Discovery Series events and a selection of optional tours. Further expand your discoveries with our new optional trip extension to theHighlights of Poland: Warsaw & Krakow. Travel from the Galapagos Archipelago to the Sacred Valley of the Incas. More than a vacation, this Explorations tour offers a look into mankind’s collective history. Cruise the Galapagos Islands, made famous by Charles Darwin. Set foot in two hemispheres at the Equatorial Line Monument. Connect with one of a kind wildlife and delve into ancient cultures. Overnight at the base of Machu Picchu and take advantage of the chance to explore this “Lost City” twice in two days. Visit the UNESCO Spanish colonial cities of Lima, Quito and Cuzco. Throughout Ecuador and Peru, look toward the future and reflect on days gone by. Embark on a five-day cruise of the Galapagos Islands with a naturalist guide – see blue-footed boobies, sea lions, iguanas and more! Admire the giant tortoises at the Charles Darwin Research Station and learn about conservation projects. Climb from the Sacred Valley to Machu Picchu aboard one of the world's most famed train rides. Enjoy dinner at the Larco Museum in Lima, housed in an 18th-century mansion surrounded by lush gardens. Like something out of a dream. Explore the pure scenic vistas and magnificent wildlife of Kenya. Discover the thriving culture and experiences that make it one of the most popular African countries to visit. Numerous game drives bring you in search of the “Big 5” on your once-in-a-lifetime safari adventures. Visit the Rothschild Giraffe Sanctuary. Spend two nights at the elegant Mt. Kenya Safari Club. Marvel at thousands of flamingos during your visit to Lake Nakuru. Your stay inside the Masai Mara game reserve features a traditional bush dinner with Masai dance performance and full day game drive. All that is magical about Africa is calling to you. See a Rothschild giraffe up-close as you feed them from a raised platform. Spend two nights at the famous Fairmont Mt. Kenya Safari Club, once William Holden's private retreat.